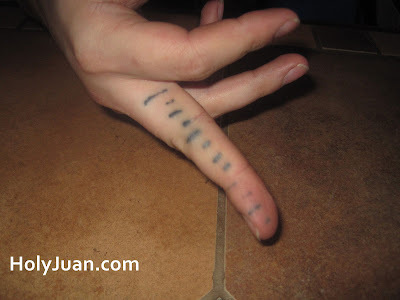 HolyJuan: How Long is Your Finger? My co-worker, Levi, decided to not deal with the hassle of carrying around a 3 inch ruler, so he had one tattooed on his finger. I'm sure it is a great idea, but now in Levi's language there are only things that are less than 3" and more than 3".